Speaking of the unexpected, I had to make a trip recently to Singapore. It was a forced vacation of sorts, not because life was too stressful, but rather a result of frustratingly slow government paperwork related to my visa. So, after I moved through the anger at the whole situation and the hours spent at immigration, I settled into excitement that I had to travel somewhere (it’s not good to overstay one’s visa), and that somewhere I chose was Singapore. Now I’m just hanging tight while the paperwork inches along. Singapore is a close neighbor to Indonesia, but so very different. It is a city-state (a diverse population more than 5 million with Chinese, Malay and Indian being the largest ethnicities) situated on a small island at the southern tip of the Malay peninsula, just east of Sumatra. Once I made it through the 7+ hour journey by public bus and shared taxi over the mountainous, sometimes broken, and crowded roads leading from Balige to the nearest airport in Medan, the flight was only an hour. Butterfly Garden in the airport. Singapore’s infrastructure is among the best in the world with clean, safe, efficient and abundant public transportation. And it’s airport is also among the best in the world (transit hotel, orchid garden, butterfly garden, free internet and entertainment…hello). There aren’t many airports in the world where I’d actually spend time touring around for all the free stuff. 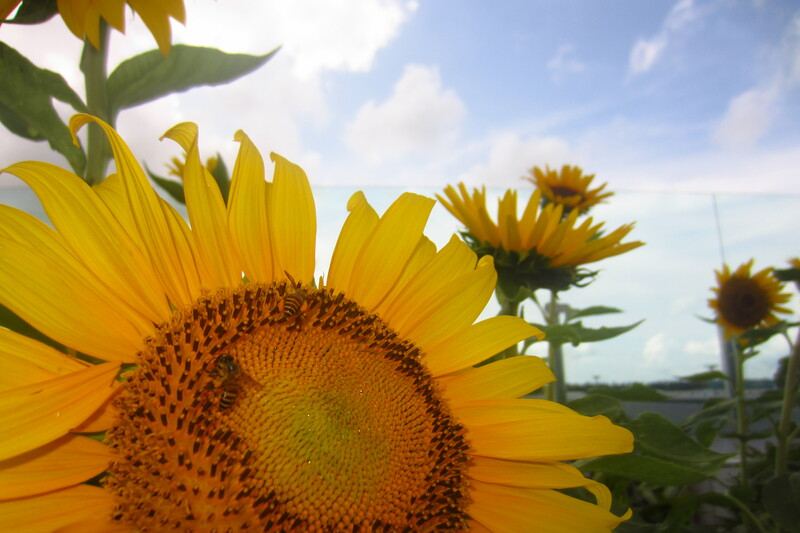 Sunflower garden. In Changi Airport, Singapore. Already familiar with subway trains and surface busses of this sort, I moved around the city with ease, making the most of the short time (taking trains was included in the fun). Although Singapore is a large city, it’s label of “Garden city” is well-deserved. 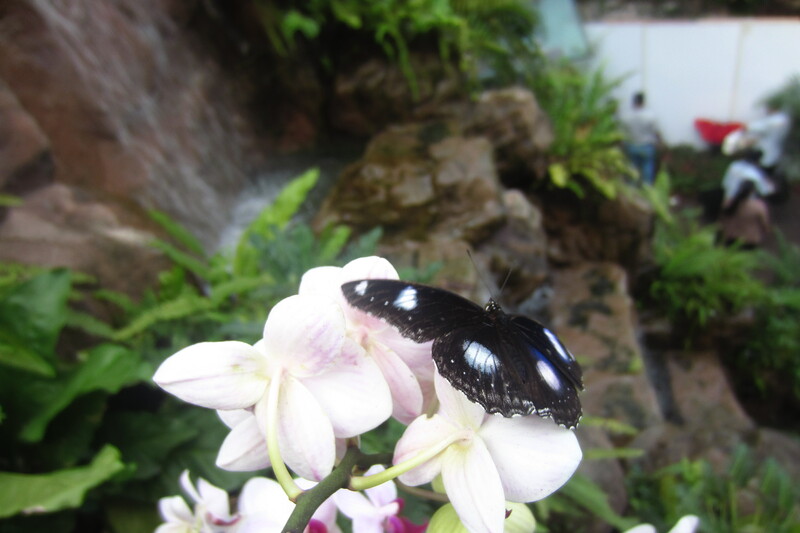 I visited the Chinese Gardens and Botanic Gardens, as well as the gardens within the airport. There was culture shock. Coming from friendly crowded Indonesia (specifically rural northern Sumatra), it was interesting to note what I’d left behind in America, present in Singapore: Tall well-built buildings towering over the well-paved streets; most people had cars, not motorbikes; and a lot of life seemed to be lived inside. Also to note, that when traveling on public transit, people don’t look at each other and many are glued to their iPhones while listening to music. This introvert was alright with not talking much to people (and anyway, it was so much a part of growing up in the US and living in Seattle for 7 years). But as soon as I was back in Indonesia, I met people along the way (one invited me to her wedding next month). And I enjoy that, too. In fact, it’s quite beautiful and something I deeply appreciate about Indonesia and the culture of the Batak people here in north Sumatra. View of the city from the Chinese Garden. Butterfly Garden in the airport. 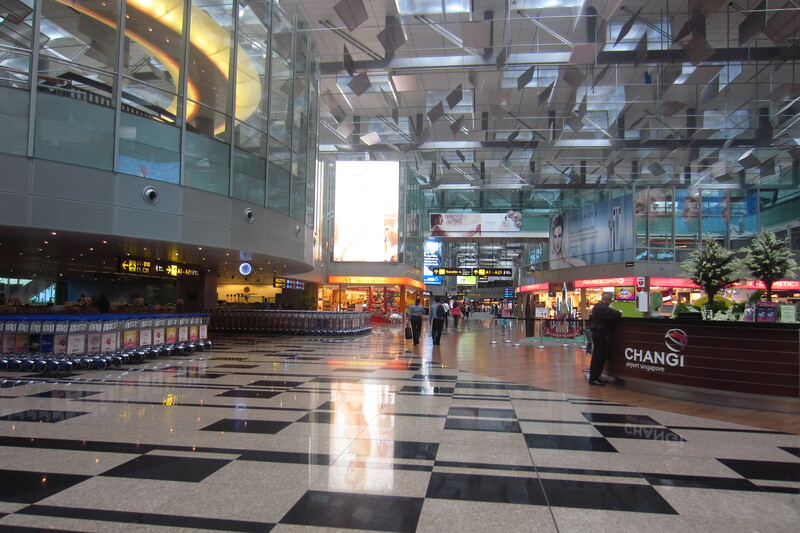 Changi Airport, Singapore.